After Justin Bieber, get ready to get up close with the firework-- Katy Perry! She is releasing a documentary film--in 3D ! 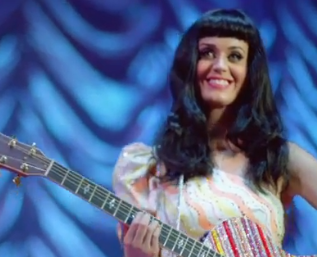 Screenshot of Katy Perry's trailer for her debut film, "Part of Me". According to Katy, she has teamed up with Paramount and Imagine for an intimate documentation of her life on and off stage during her California Dreams Tour. In her own words: "I want to take you behind the cotton candy clouds and reveal the highs and lows and nuts of bolts (sic) of this extraordinary ride. I promise you, after seeing this film, you will truly know me." Check out this trailer to get a sneak peek of what to expect!